Burton Agnes Manor House is a rectangular, late 12th century stone first floor hall house, founded by Roger de Stuteville. The house is the only surviving part of a much larger defensible manorial complex, which was later annexed by the adjacent Burton Agnes Hall. The original vaulted undercroft and newel stair now gives access to the hall, with its later alterations. It was probably Sir Walter Griffith, who added the 15th century king-post roof, on elevated walls. 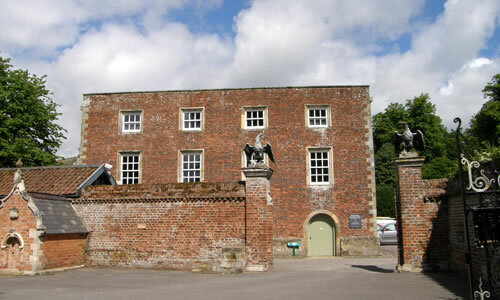 In the early 17th century the Norman manor house was encased in brick and used as servants quarters, remodelled in the 18th century it was then used as a laundry. 2 miles south-west at Harpham is the Church of St John of Beverley and 6 miles north-east at Bridlington is The Bayle Gate. Burton Agnes Manor House is located in the grounds of Burton Agnes Hall, off Shady Lane. 34 miles north-east of York, on the A166-A614. The site is under the guardianship English Heritage and is open daily, April to September 11:00-5:00pm.